[0:28] <SpeedEvil> jda2000: the ethernet card has enough memory to buffer one frame. [0:29] <SpeedEvil> jda2000: Also - seeks happen without any CPU or USB intervention. [0:52] <delinquentme> How do configure a python script to run on startup? [0:52] <nmpro> any opinions here about the Minnowboard? for it? against it? [0:56] <pksato> Its is expensive. [1:02] <delinquentme> how to stop the raspberrypi from running nginx on startup :D? [1:03] <simard> why does htop say I have "only" 461MB of RAM instead of 512MB ? [1:04] <pksato> simard: X reserved to GPU, Y to intenal use, and Z for kernel. [1:07] <pksato> delinquentme: insserv -r nginx ? 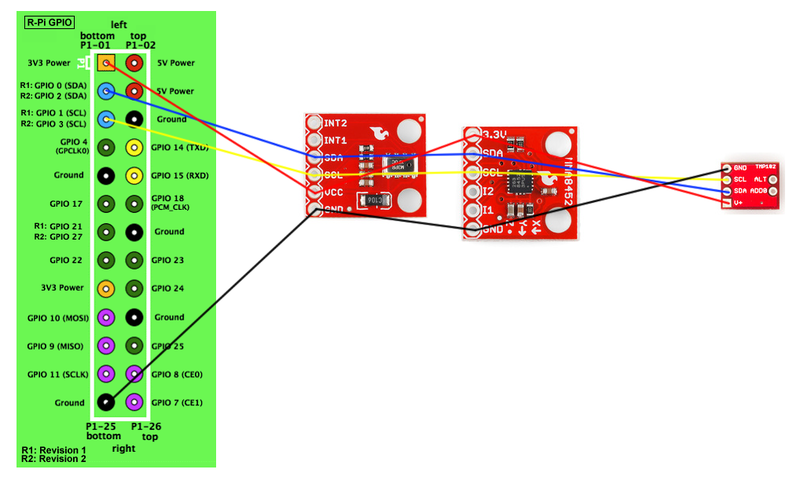 [3:32] <Sonny_Jim> Any GPIO wizards about? [4:17] <darkPassenger> will B.O.O.T work on a class 10 32 gb sd card ? [4:17] <darkPassenger> boot, what am I saying, I mean noob! [4:20] <sney> should be fine. [6:22] <Jeebiss> Anyone familar with pyaudio? [10:34] <Chetic> where should I start to look? [10:35] <Chetic> I thought the breakout boards were just ready to attach to an i2c-bus..
[10:36] <ShorTie> do they work individually ?? [10:36] <Chetic> but what if they do? [10:42] <Chetic> I'm not sure what you mean by termination resistor? [10:45] <ShorTie> are there any jumpers on the boards ?? [10:47] <Chetic> "to define the end".. I think you mean what I've heard referenced as "pull-up resistors"
[10:50] <ShorTie> have you played at all with the jumpers to give them different addresses ?? [10:52] <ShorTie> are you sure they are not fighting over the same address ?? [10:53] <zer0def> hey guys, any archlinux rpi users here? [11:10] <Chetic> but you don't see any obvious problem with resistance? [11:28] <mgottschlag> Chetic: do all three boards work if you only plug one in at a time? [11:31] <Nefarious___> Hey, I've got a raspberry pi with lighttps, MySQL, etc using it as a webserver (obviously). but before I register a domain name, I wasn't sure if I could have dynamic DNS pointing to the registrar AND cloudflare, since I have dynamic DNS. is this possible? [11:55] <Nefarious___> but with cloudflare + a separate domain name provider. [12:28] <goganchic> is it possible to connect battery to raspberry pi and get info about current voltage & other useful data to find out how long this battery will work? [12:31] <chris_99> you mean from the RPi? [12:31] <goganchic> dowlf, any useful links? [12:32] <shiftplusone> Yeah, you can't ask the battery and the pi itself is not aware of its power usage. [12:33] <goganchic> chris_99, shiftplusone is it any special batteries for RPi exist? [12:33] <shiftplusone> goganchic, I don't know, sorry. [12:36] <Lejoni> Hmm dose the Pi have any Analog GPIO inputs? [12:37] <Lejoni> could still prolly be done with some external circutry. [12:37] <shiftplusone> You'd either have to use an ADC chip or resort to clever hacks. [12:51] <ShorTie> that DS2438 sounds like an interesting chip to me, until i get to the part "The customization for a particular battery chemistry and capacity is realized in the code programmed into the microcontroller and DS2438 EEPROM, and only a software revision is necessary should a designer wish to change battery pack chemistry." [14:17] <rendar> hi, when i boot my rasp, (without start Xorg) i type in console 'loadkeys it' since i have an italian keyboard, but i only get this: "Couldn't get a file descriptor referring to the console" -- any clue how to solve this? [14:21] <patagonicus> rendar: Looks like loadkeys has to be run as root (i.e. with sudo), however I think raspi-config lets you select a layout which will automatically be set. [14:23] <patagonicus> rendar: Do you have /usr/share/keymaps/i386/qwerty/it.map.gz? If so it should work. If not, either a package was uninstalled/not installed or some files got lost. [14:25] <rendar> is that possible?! [14:25] <patagonicus> It should be. Hmm. [14:26] <rendar> patagonicus: what about that 'i386' directory? [14:26] <rendar> isn't that wrong, since i'm on ARM here? [14:27] <patagonicus> rendar: I think it should still be there as it's the same keymap (which was probably first added with a x86 machine). [14:28] <pksato> rendar: have a /dev/console ? [14:29] <pksato> the /dev/console ? [14:29] <patagonicus> rendar: Do you have keyboard-configuration installed? You can try (re)installing it. [14:31] <patagonicus> rendar: Try sudo apt-get install keyboard-configuration, I think that's the package that should contain the keyboard layouts. [14:32] <rendar> keyboard-configuration is already the newest version. [14:33] <pksato> or, have a file system error. Is a new SD card? [14:34] <rendar> ok now it works! [14:43] <pksato> that kind of display? [14:46] <pksato> download of images using torrent are working? [14:52] <gordonDrogon> they're not general purpose video out devices though. [14:53] <luc4> what do you mean? [14:55] <pksato> to best result use hdmi input display plus usb touch panel. [15:04] <pksato> luc4: you try to create a tablet using RPi? [15:20] <luc4> pksato: not exactly, my intent is to propose rpi to my company to create products that now requires a tablet. [15:23] <luc4> pksato: I've been doing some open source with rpi, I would like to try to bring componies in as well, but I'm finding it difficult. [15:54] <BCMM> what's the deal with the Pi's analogue audio output? people keep complaining about it, but it doesn't sound too bad to me. Are there any objective issues with its quality, on recent firmware? [15:56] <patagonicus> Well, I only tried it once and it had an easily audible buzzing when no sound was played. [16:02] <BCMM> maybe like old raspbian, where you had to run a special tool? [17:19] <letstest> I am looking to use the raspberry pi camera as a motion sensor, i prefer to use straight up bash. Is there a way to do that? [17:43] <crumb> anyone used the linaro build tools? [18:10] <nmpro> good morning everyone! [18:20] <Armand> A bot that loads the cartridges for you? [18:30] <Sonny_Jim> gordonDrogon: You around? [18:33] <Sonny_Jim> Did you look at the gamefaqs link? [18:38] <Sonny_Jim> Just to be sure, I am reading section 5 of that link right? [18:59] <SirLagz> I need to replace a string, with a variable number of '/'s at the front, with just one /. What would be the best way to do that ? [19:34] <mgottschlag> what if the SD card driver blocks the cpu for a millisecond? [19:37] <SirLagz> anyone know of a filebrowser that has been built in whiptail ? [19:38] <shiftplusone> SirLagz, I think I saw you asking this on the forum. That's not what whiptail is for. [19:41] <shiftplusone> If it's not built into whiptail, it's going to be a bit of a pain. [19:45] <shiftplusone> huzzah! What are you hacking together anyway? [19:47] <shiftplusone> Except not... I believe the guy wanted a way to get an img file without waiting all the time for the unused space as well... so that wouldn't help there. [19:48] <SirLagz> wait...you mean when he dd's the image ? [19:49] <SirLagz> "backup image - minimal"
[19:49] <shiftplusone> How? Resize the fs before or create an image and then copy the files into it? [19:51] <SirLagz> which means either massive RAM usage, or extra storage mounted. [19:51] <SirLagz> it makes it more complicated when they are using a LiveCD though. [19:53] <shiftplusone> are CDs still a thing? [19:55] <Hopsy> is it possible to make a bridge from wlan0 to eth0 ? [19:56] <SirLagz> and you want device to connect to WiFi AP ? [19:58] <Hopsy> mgottschlag: hmm, cant I add it in /etc/network/interfaces? [20:00] <SirLagz> anyway. sleep time for me. g'night ! [20:01] <Hopsy> SirLagz: do you have a website? [20:03] <SirLagz> dagnabbit. now. going. now. [20:14] <Hopsy> wlan0 to eth0 OR eth0 to wlan0 ? [21:15] <Dagger2> SirLagz: `readlink -f`? [21:18] <vinse> how much did you pay overall?